The damaging report published by The Hindu Newspaper provides the clinching evidence that PMO was hobnobbing with the negotiations in the purchase of Rafael aircraft from France. In other words it’s the PM who was presiding over the act of corruption using his high office. ‘The Hindu’ reportage by N. Ram that “Government waived anti-corruption clauses in Rafale deal” and “Defence Ministry protested against PMO undermining Rafale negotiations,” conclusively has given the proof that this government is corrupt and has misled the nation on Rafale deal. Now the ball is in the BJP’s court to provide equally powerful documentary evidences to claim the moral high ground that it has provided a corruption free government. Its denial in media or public forum won’t convince the nation. This is no small issue and cannot be brushed under the carpet. It involves the PMO, the highest executive office of the country that is indicted on corruption charges. This new evidences provided by ‘The Hindu’ is a fit case to be heard by the Supreme Court that can reopen the case on the Rafale deal where it has already given a clean chit to the government. Now there is a new twist in this case and the highest office of the country is mired in corruption. As such the intervention of the Supreme Court is must because it undermines the entire edifice of governance of the country. Will the apex court reopen the Rafale deal case and call the investigation as to who is misleading the nation. Can it ask the PMO to stand in the dock and deny the allegations? Will the PMO wash its dirty linen in the Supreme Court? It’s a testing time for the entire nation. If that happens then an interesting tussle between the judiciary and the executive is bound to be witnessed as to who is higher of the two democratic symbols. So now after the new findings the pendulum has shifted to the judiciary and it remains to be seen how it further handles the Rafale deal case. The American business magazine ‘Forbes’ has published an article giving graphic account of how corruption is still thriving under Modi’s regime. It says five years ago, people in India gave Narendra Modi the chance to realize his big promise to clean up corruption in the country. But today, Modi’s promise remains a promise and corruption is still thriving in all the usual places in India. The reputed magazine says the erstwhile Congress-led UPA-II dispensation at the end of its tenure, had acquired a reputation of being mired in many corrupt deeds and it’s the same “odium” that is now being attached to the Modi government. The magazine cites evidences of high profile corruption cases that has shook Modi’s administration. 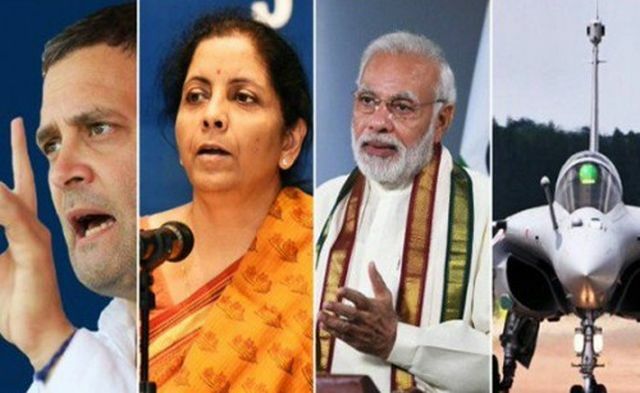 To name a few is the murky Rs 60, 000 crore weapons deal with France to purchase 36 Rafale fighter planes. Then the Rs 200 crore bank fraud uncovered last year at the Punjab National Bank. These two are just a tip in the iceberg of scandals that has shaken the nation under Modi regime. Meanwhile, a report by the Committee to Protect Journalists (CPJ) states that India is ranked among the “worst offenders,” in terms of graft and press freedom in the Asia Pacific region in 2017. This is another damaging report on Modi government performance since it had come to power with the plank to free India from corruption. Similarly, the ‘Transparency International’ (TI) a leading non political, independent, non-governmental anti-corruption organisatio has documented corruption under Modi regime ranking India at 78 out of 175 countries. The recent ranking is worse than its 2015 ranking of India. These findings have surprised Indians because Prime Minister Modi has come to power with a promise to free India from the vice of corruption. After coming to power Narander Modi made some bold moves to control corruption. He banned 500 and 1000 rupee notes to get rid of “black money.” However this measure miserably failed to achieve any tangible results. The government could recover fake currency only to the tune of Rs. 41 crore that accounted for only 0.0027 per cent of the total currency that came back into the system following notes ban. At the fag end of the BJP government’s tenure in office it appears that that PM Modi was fighting corruption among the country’s poor but was maintaining stock silence corruption in the high places, especially among the rich of the country. The Rafael deal and the Punjab National bank cases are examples to this trend. Whatever may be the government’s statistics on the GDP growth rate or on the developmental index, India remains a breeding ground of corruption. The Modi government had failed to spread the benefits of economic growth to the masses and on the contrary he encouraged a narrow elite to thrive under his regime giving rise to crony capitalism. If we look back, the corruption allegation against the Congress-led UPA-II had reached its crescendo by 2014 and its reverberation facilitated the current BJP government to come to power. The incumbent PM personified the aspirations of the millions of Indians when he gave the assurance that neither he will indulge in corruption nor allow anyone else to do that. His assurance to rid the country of corruption raised him to the level of the pied piper of Hamlin that had lulled the rats to the river through his music. In this case, the nation responded to the music of bringing good days (Ache Din), by giving a thumping majority to Narandera Modi. India’s situation under Modi rule is neither new nor unique. Every successive government aspiring for power make populists promises like ending poverty and bringing prosperity etc. However, after coming to power the incumbent government becomes a breeding ground for corruption. This is exactly what has happened under the Modi regime. He came to the office with the promise to change the situation of the people but what he actually did is to change the rules and regulation that may help only few elites while the masses continue to reel under misery. Indian journey since seventy years or so has been abysmally a low speed train ride. Who, How, When it will change only God knows. Indian politicians have a jolly good time after hoodwinking the people. As a silent spectator the people by and large are a witness to the inchoate images of changing India.